I found this new Kiwi Apple Sour drink from Oasis in an independent cafe. When I asked for it, to go with my sandwich, the lady serving took it out of the fridge but told me it was the first one she sold as they had been newly put out that morning. As it happens I saved it for the train on the way home. The drink doesn't mention anything on the front of the bottle about it being sugar free (or indeed new or limited edition), but the label on the back describes itself as being a fruit juice drink with sweeteners, and I couldn't see any added sugar on the label. Perhaps that is the way of things these days with companies trying to reduce added sugar, that it is just becoming the norm. I was a little wary of the word “sour” in the name, and hoped it wouldn't be too acidic, on a warm muggy day I was hoping for more of a focus on refreshing. On this the flavour delivered. Kiwi is an unusual choice for a mainstream drink but it forms the initial taste and is surprisingly soft and every enjoyable. The sour taste kicks in with the aftertaste, and this is the sour apple element. It isn't too sour but leaves a lovely fresh clean zingy flavour that lingers on the palette. The taste is just enough to be refreshing but still steers away from lip twisting. 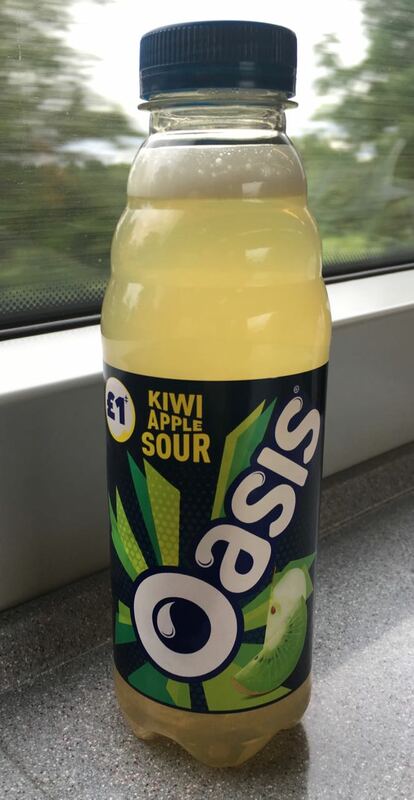 The conclusion is that kiwi and apple go surprisingly well together, and that there really should be more kiwi flavoured items on the market. I noticed a second new Oasis flavour in the shop too which was Sour Cherry, I’m going to have to give that the taste test next.